Hundreds of companies vowed to axe deforestation from their supply chains, but a new report says they’re failing forests. There have been so many forest-saving announcements over the years it’s hard to keep track of them all. First came the big news of 2010 that 400+ companies in the Consumer Goods Forum would ensure that all their soy, palm oil, beef and pulp and paper would be zero net deforestation by 2020. 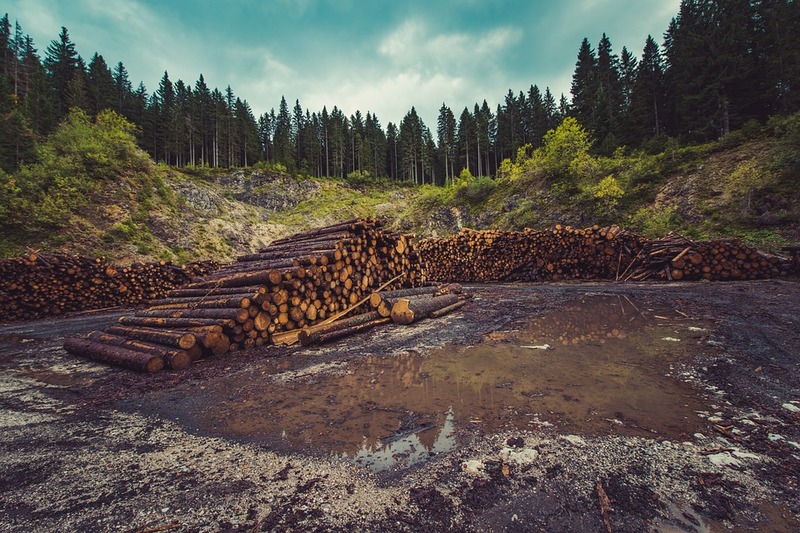 Then, during a blue-sky day at a UN climate summit in September 2014, over 190 governments, companies (including Nestle, Kellogg’s and Cargill) and civil society organizations signed the New York Declaration on Forests with the goal of halving the loss of natural forests by 2020, striving to end it altogether by 2030. Amidst a lack of firm climate commitments, the forest declaration – while voluntary – felt fairly concrete, it felt good, it felt doable. And the pledges kept on coming. After years of bad press, dozens of the world’s biggest palm oil producers and traders earned praise for promising to take on the ‘zero-net deforestation by 2020’ goal. Hundreds more companies from Unilever to McDonald’s had jumped on board. 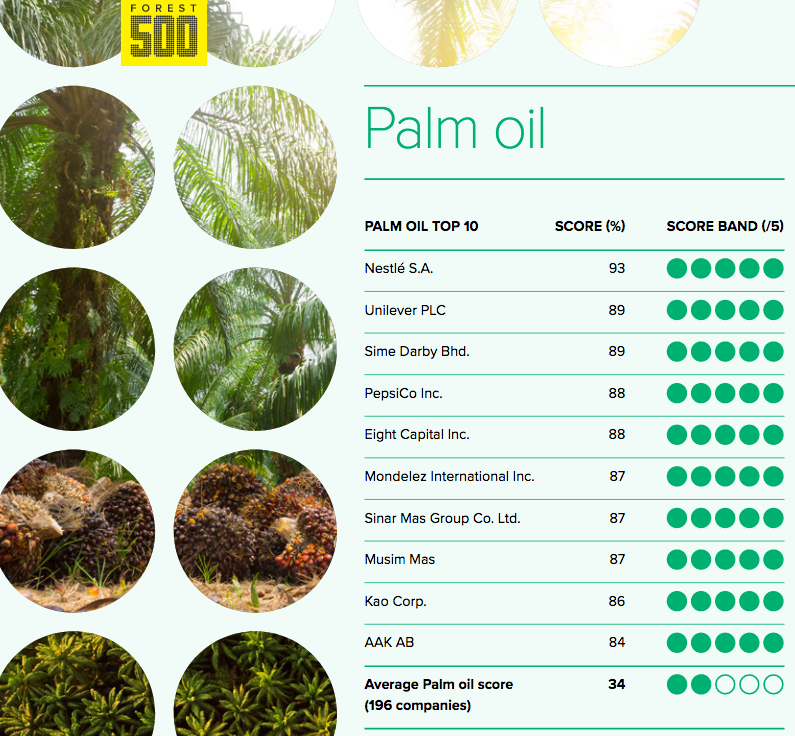 Over 40% of the companies ranked aren’t doing anything to tackle deforestation in their supply chains when it comes to palm oil, soy, cattle, timber and pulp and paper. Almost 1/3 of those that made commitments didn’t include any concrete policies on implementing those commitments, including publishing direct supplier lists or monitoring/verifying compliance. Some companies are getting with the program. At least a handful are reporting on exactly how close they are to meeting their target. In 2017, Nestle said 58% of its deforestation commitments were met. JBS (the world’s largest processor of a fresh beef and pork) reported that 99.7% of its purchases were compliant and independently audited, with maps of all of its Amazon suppliers. However, Global Canopy points out that the commitment only applies to the Amazon rainforest and not to all the areas JBS source from. While the latest Forest 500 report does offer a bit of data on whether sectors are disclosing supplier maps (overall, disclosure rates are abysmal), we were hoping to see Global Canopy share a list of corporate leaders and laggards on this front. Transparency is, after all, the oxygen for civil society to hold companies to account. Many major apparel companies have been posting their factory supplier lists for years. If major food companies aren’t sharing their palm suppliers, soy farms or cattle ranches, let’s call them out with a megaphone. Speaking of cattle, they’re the largest driver of tropical deforestation globally, and yet companies in cattle supply chains are least likely to have a commitment. According to the report, only 16% of companies have a forest-related commitment for the beef or leather that they produce or source. Cattle are the largest driver of tropical deforestation, but only 16% of companies have a forest-related commitment for their beef or leather. In recognition of the gap between company commitments and impacts on the ground, the Forest 500 methodology was updated in 2018 to “better distinguish between companies who have set commitments, and those that have taken the next step towards implementation.” Still, onlookers will note major discrepancies in how the the organization grades top brands compared to say other forest advocates. 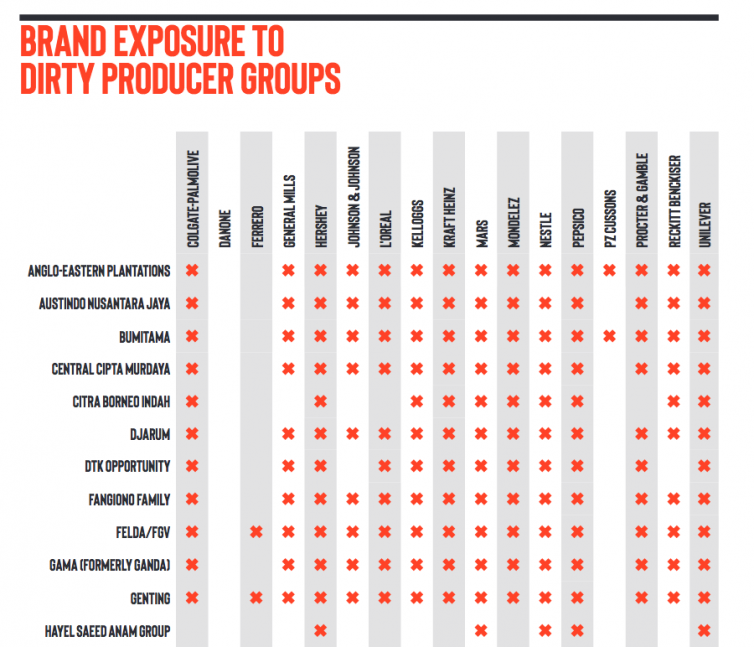 Global Canopy gives companies like Nestle, Mondelez and PepsiCo five out of five on their palm policies (see below), when Chain Reaction Research reported in 2018 that the same brands were buying from a top 10 deforester in Asia. Greenpeace International reported that major brands like Nestle, PepsiCo, Unilever and Mondelez were sourcing from palm suppliers responsible for destroying an area of rainforest almost twice the size of Singapore in less than three years. Either way, Global Canopy, Greenpeace and others agree that that industry is worryingly behind on sticking to their word. And the longer it takes corporate supply chains to catch up to their public commitments, the more natural forests it’s going to cost us.